Private investments in public equity (PIPEs) offer a practical financing alternative for companies seeking capital and a unique asset for investors. For practitioners who know how to identify and execute transactions, PIPEs present a growing opportunity. This revised and updated guide presents the views, voices, and invaluable expertise of leading practitioners from all specialties in the field. 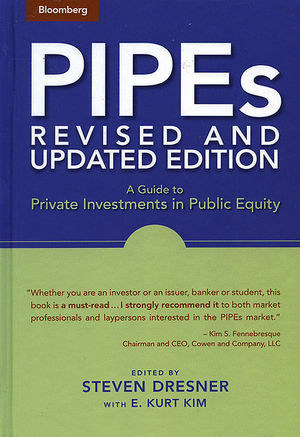 The book is divided into three parts: "The Business of PIPEs," which provides a historical backdrop and overview; "Regulatory Landscape and Structural Alternatives," which details the legal framework and transaction structures; and "Deal Flow," which offers the investor’s perspective on negotiating deals. With detailed discussions, ranging from the origins of the marketplace and deal structures to legal considerations and due diligence, and from finding new opportunities to trading strategies, this book provides a clear window to the inner workings of this active area of the small-cap market. Investors, financial analysts, investment bankers, corporate and securities attorneys, and executives of public companies will find substantial value in the pages of this book. Steven Dresner is publisher of The PIPEs Report (www.pipesreport.com), the first publication dedicated to providing news, information, and analysis of private investments in public equity. Formerly, Mr. Dresner was a vice president in the investment banking group at Ladenburg Thalmann & Co., a top-performing placement agent for PIPE transactions as ranked by independent sources. Mr. Dresner was also chairman and chief executive officer of the telecommunications company and software developer VCOM Corporation. In addition to publishing The PIPEs Report, Mr. Dresner is publisher of The Small Cap Report (www.smallcapreport.com), a monthly research publication focused on small- and micro-cap equity analysis and market trends and The Reverse Merger Report, a quarterly focused on the business of shell mergers and SPACs. As president of DealFlow Media, Mr. Dresner also produces one of Wall Street’s largest annual events, The PIPEs Conference. E. Kurt Kim is the founder and chief executive officer of PrivateRaise, LLC (www.PrivateRaise.com), the leading research consultancy for comprehensive market intelligence and analysis pertaining to private placements of equity and equity-linked securities executed by public companies. PrivateRaise.com was awarded Forbes's 2002 Best of the Web designation in the Financial Content Provider category. Mr. Kim has spent the past decade in various advisory and deal-making capacities within the financial-services sector. Part 1. The Business of PIPEs. 1. Overview: An Emerging Market (Richard E. Gormley). 2. The Marketplace: A Statistical Summary (E. Kurt Kim). 3. A Historical Perspective: The Bubble, Converts, and the Birth of Structured PIPEs (James F. O'Brien Jr.). 4. The Players: Issues, Investors, Agents and Regulators (Steven Dresner and Brett Goetschius). Part 2. Regulatory Landscape and Structural Alternatives. 5. The Law: Legand and Regulatory Framework (James R. Tanenbaum and Anna T. Pinedo). 6. Fundamental PIPEs: Typical Structures and Transactions (Eleazer Klein). 7. Registered PIPEs: Registered Direct Transactions (Joseph Smith). 8. Litigation Strategies: Manageing Litigation Risk and Addressing Other Investor Concerns (Perrie Weiner and Edward Totino). 9. managing Risk: Securities Structures, Trading, and Deal Documentation (Steve Winters). 10. Due Deligence and Valuation Policy: Caveat Emptor Squared (Stewart Flink). 11. Reverse Mergers and PIPEs: The New Small-Cap IPO (David Feldman).